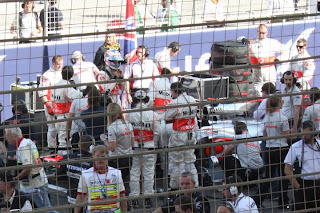 I have never been to the Melbourne Grand Prix and have never had the inclination to attend... just not a fan of fast cars and noise... that's just me....I know plenty of people are. Even so, it clearly is a subconscious prerequisite for me to live in a city where a GP is held! First Melbourne, then Bahrain... (Does this mean that I will be moving to Malaysia or Brazil next??) As I understand it, the first GP of the year is traditionally held in Melbourne. 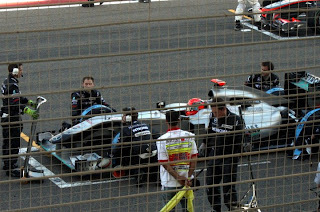 Bahrain hosts the third race of the year. For whatever reason, Melbourne is hosting the second GP of this year and Bahrain staged the opening race of the 2010 season. All the big names in racing were out here at the Bahrain Circuit which is located at Sakhir, a desert area just on the outskirts of Manama. Compared to Melbourne or Monaco, the event is pretty tame...for eg, there are no grid girls around to distract the (male) spectators! 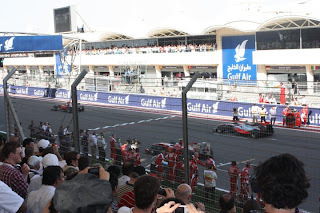 If you have followed the news, you would know that this year Fernando Alonso won for Ferrari...but you might not know that when he won, instead of spraying the traditional champagne on the podium, he sprayed an Arabic, non-alcoholic rosewater called "Waard." How's that for Trivia? Anyway - I didn't attend, but my friend J did and she has kindly allowed me to share a couple of her snaps from the event. Thanks J!